Thursday, December 6, 2018. Phase 2: Oasis of Hope Hospital. Tijuana, Mexico. AMAZING NEWS! Over the past couple of days Jane and I have met with four doctors on two separate occasions. They all agree on the following. The cancer has stopped growing. There is NO new cancer growth. The cancer on the lungs and the abdominal area has been reduced. If you compare the two scans of the liver you will notice the difference immediately. The scan on the right was taken on August 9, 2018. 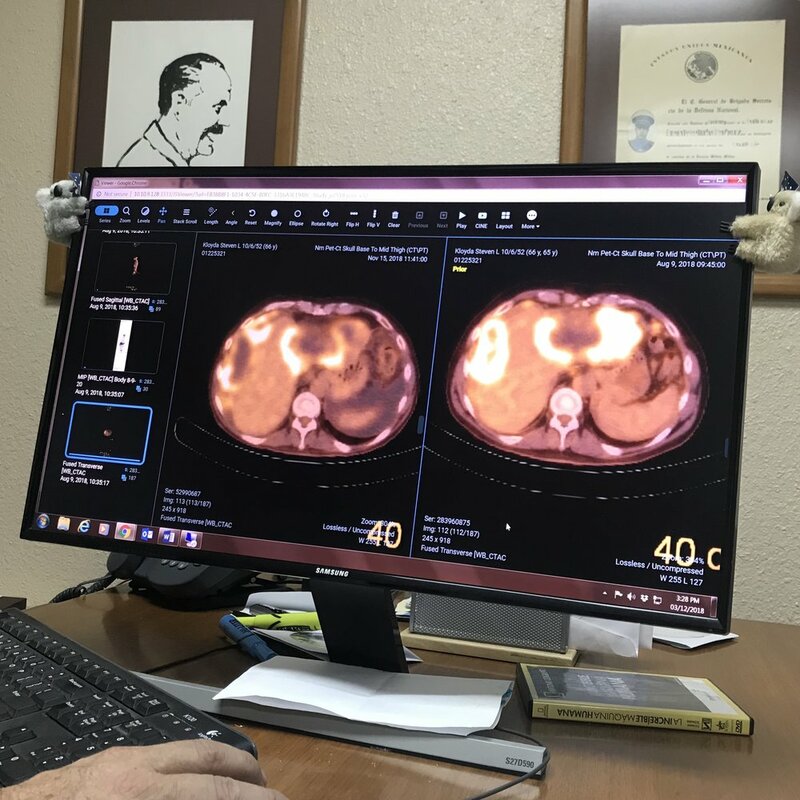 The scan on the left was taken three months later on November 15, 2018. The bright white spots on both scans shows the cancer. Look at the difference between the scan on the left versus the one on the right. WOW! The bright white spots on the right scan are significantly larger. Now compare the size of the white spots on the left. Not only are the spots smaller but those big dark spots you see on the left scan are DEAD cancer cells. YES, dead cancer cells. Look at the difference!!! God is doing a miracle in Tijuana. PRAISE GOD! Jane and I feel like we are walking on water. We are focused on Jesus and NOT the storm around us. The past couple of days have been so encouraging. God is GOOD all the time! All of HIS promises are yes and amen. The bottom is this. God is WORKING through the doctors in Tijuana. The doctors are extremely encouraged and want to see us back at Oasis in March, which is AWESOME! We are definitely moving in the right direction. God is doing a miracle in Tijuana! Jane and I are so thankful for all of your love, prayers and support. Please spread the testimony. By the way, we still need to raise significant funds. If you have already given, would you consider giving again if that is something God puts on your heart? If you haven't given, would you pray about that as well. Jane and I are so grateful for all of the donations that we have received. No matter how large or small your giving is greatly appreciated. You can go here to donate. Thank You!